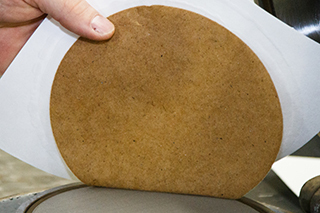 Test results on handsheets made with this procedure are often used to describe properties of market pulps. The results are also used to determine properties of mixtures of hardwood/softwood or of fiber species to obtain desired properties for machine made papers. To perform adequate testing the equivalent of 30 oven dry grams is desired. This ensures proper moisture testing and disintegration of the sample. IPS usually makes ten handsheets per pulp sample, this may vary upon tests required, customer needs, and pulp availability.